It is a great shame that the exotic scoring, which calls for a range of instruments including a Yaqui metal rattle and a rattling string of deer hooves, means that Carlos Chávez's 1936 Sinfonía India is rarely heard in the concert hall. Fortunately this fine work, which is sometimes sniffily dismissed as 'folkloric', has fared better on record. The brilliant gatefold artwork seen here is from the original 1981 EMI LP release of Enrique Bátiz's account of Sinfonía India recorded with the Orquesta Filarmónica de la Ciudad de México and featured on the path last year. 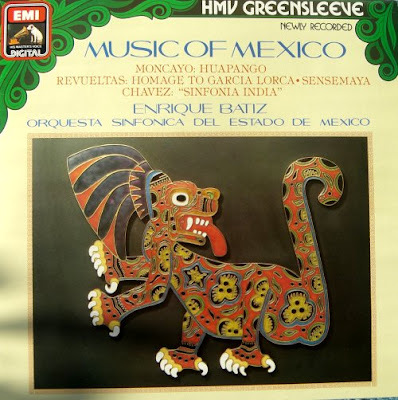 The early Soundstream digital sound of the Mexican recording lacks impact, but it is available as a CD transfer in a Brilliant Classics eight disc budget compilation. Also now on CD is Carlos Chávez's own recording which has the advantage of being captured in stunning Everest analogue sound using 35mm magnetic film stock. Talking of the media of film but moving to the 21st century you can sample Sinfonía India in this 8 minute video of Gustavo Dudamel conducting the Berlin Philharmonic, no less, in the closing pages of the single movement work. The film is from a June 2008 outdoor concert in Berlin in front of an audience of 20,000 - exactly the right venue for this music. Carlos Chávez gave the first performance of Colin McPhee's pioneering minimalist work Tabuh-Tabuhan with the Orquesta Filarmónica de la Ciudad de México in 1936. Read the full story, and see my photos of Mexico in the 1970s, here. Bob, The Nation Symphony Orchestra of Mexico came to Paris to play a superb program that included the Chavez India and Revueltas La noche de los mayas. 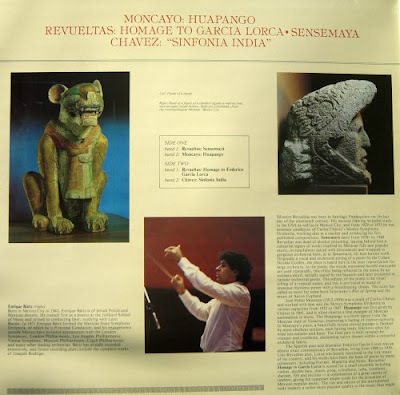 Moncayo's Huapango was one of the encore and was simply marvelous. The conductor Carlos Miguel Prieto (a Harvard Business School classmate by the way), introduced in spotless French the instruments of the Chavez. The program was simply outstanding. The color of the orchestra had nothing to do with German, French or American Orchestras. It was a more "macho" sound with thicker not silky strings, a tougher brass. A review in french is at: http://www.concertonet.com/scripts/review.php?ID_review=4426. Hello, i am writing analysis of Sinfonia India, Carlos Chavez. Do you have any info on him or this piece as i really like it but i found it very hard to find any source about the piece or him self?